Transitioning is hard. 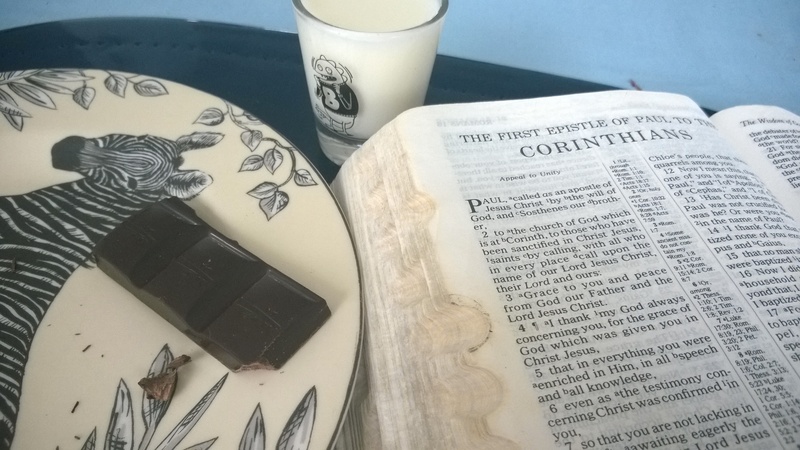 It’s a new place in my Bible, new chocolate, new Bible Gateway link to a new book, and it’s gonna be new hashtags when I post the photo to Instagram. I’ve got that Psalms momentum, but here I am taking a hard right turn, and it’s just about killed my velocity. I read 1 Corinthians 1 today—I’ve been thinking about doing a series on everything Paul wrote, call it All the Paul. And since we’ve already gone through Romans, I figured I’d get into the next book in line. But man, writing anything about this feels like tunneling through a brick wall. I guess I don’t want to miss the forest for the trees. After his standard salutations, acknowledgment of God’s grace and faithfulness, he begins to address some problems of the church in Corinth. They’re getting into schisms and picking sides between leaders in the growing church, and we might infer from vv.18-31 that they have issues with trusting in cleverness and smart-sounding intellectual elitism rather than the actual gospel. But the things that stood out to me in the chapter seem almost incidental to Paul’s main points. What do I do? Do I share my thoughts, or do I chuck ’em and try to find some thoughts that are more relevant to the thrust of the chapter? Well, maybe I’ll come back to the chapter tomorrow, but for now, I’ve gotta give you what I’ve got. It’s standard for Paul to start his letters by stating who he and his audience are with reference to God, and to give God thanks. He tells the Corinthians, “I thank my God always concerning you for the grace of God which was given you in Christ Jesus” (4). And I thought to myself, “How nice! He’s thanking God for the church at Corinth, in spite of its internal problems. But no. Read that verse again: what does he thank God for? For God’s grace. Granted, the church isn’t immaterial here, and I don’t think Paul’s ungrateful for it. But the church is kind of beside the point. Where would the church be without God’s grace, without his work to bring it together and grow all its members toward greater spiritual maturity? Grace is the foundation, and that’s what Paul has been thanking God for in his prayers. He’s grateful not for the people in themselves, but for God’s transforming work in their lives, making them something worth being thankful for. The second, seemingly unrelated thing that hit me was in the salutation. Apparently a man named Sosthenes was involved in writing the letter too. Who was this guy? He was a synagogue official in Corinth. He only shows up in one other place in the Bible, Acts 18:12-17, where he takes a beating because the Roman proconsul Gallio didn’t want to get involved in policing Jewish religious disputes. He doesn’t get much air time, but apparently he stands behind what Paul has to say in this letter, at least enough to put his name on it. And with that, All the Paul is off to a phenomenal start. I may even go back and do this chapter again, but with legitimate theological observations! No one knows but God what the future holds, so tune in for more amazingness tomorrow. Posted in 1 Corinthians, All the Paul, Daily Reading, New Testament, Topical Studies.Tagged 1 Corinthians, bible, christianity, church, devotional, epistle, God, grace, paul, sanctification, thankfulness. All Paul, all the time! Paul constantly! Never not Paul!